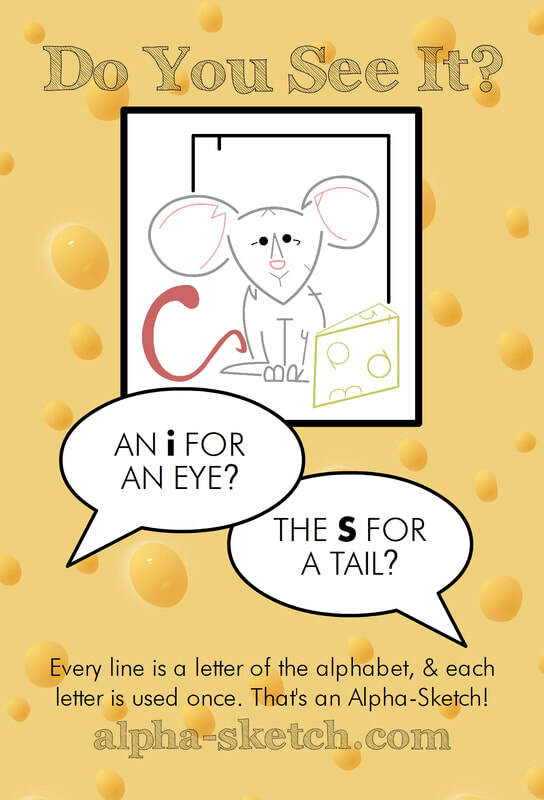 ​Every line in an Alpha-Sketch is a letter of the alphabet, and all 26 are hidden in every drawing! ​Letters may be either upper or lower case. While it may sometime appear that a letter is used more than once, that is due to how similar some letters are (ex. M is W upside down). There are no repetitions, omissions, or extra lines! This art style was created by Bradd Parton in 2009. Watch the 26 letters make the drawing! Bradd Parton is an all-ages author, illustrator, and educator based in South Carolina. He is best known for inventing the Alpha-Sketch technique where he draws using only the letters of the alphabet. Every line in an Alpha-Sketch is a letter of the alphabet. There are no omissions, repetitions, or extra lines. To date he has published thirteen books with this style: NO SHOES FOR BIGFOOT, THE LETTERS VISIT THE OCEAN, NEEDLES, THE ALPHA-SKETCH CLASSROOM, O, SAY CAN U C?, I AM NOT A CAT PERSON!, L, M, N, ...OH!, THE LETTERS LOVE THE SEASONS, THE LETTERS GO TO LUNCH, FAMOUS FACES, A IS FOR ALPHA-SKETCH: ACTIVITY & COLORING BOOK VOLUMES 1, 2, and the HOLIDAY EDITION. He also created LOOK-C, his Alpha-Sketch word-building card game that was successfully funded on Kickstarter. In addition to creating custom books for over a dozen schools each year, Bradd is currently working a new game project for 2019. Bradd's artwork has been published by Dark Horse Comics in THE SAKAI PROJECT, as well as the BALTIMORE COMIC-CON ANNUAL, and MAD MONSTER MAGAZINE. Bradd has exhibited his art or presented in schools in SC, NC, GA, KY, TN, IN, and MD so far. His first work was GLOOMY ROOMIES, a four-issue, all-ages comic mini-series chronicling the lives and unlives of a cast of monsters. It was followed up with a sequel one-short comic entitled OPEN MIC NIGHTMARE, a result of another Kickstarter campaign. 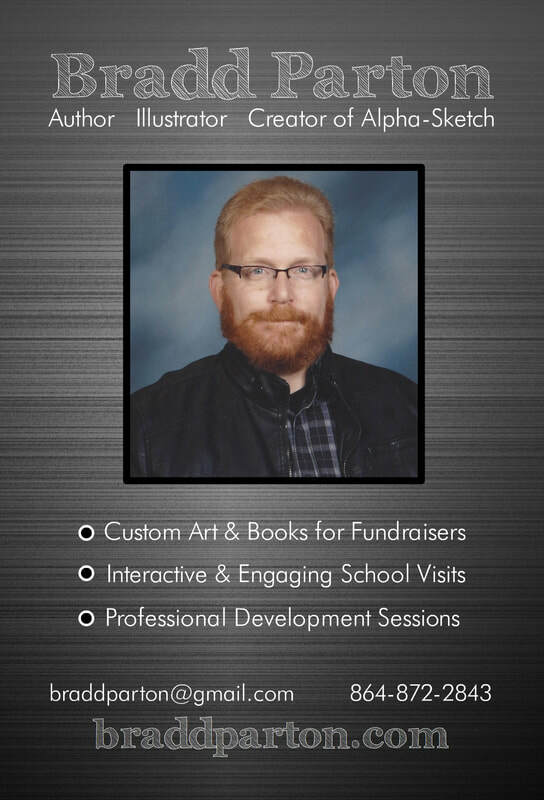 A nationally-certified teacher with over 17 years of experience, Bradd enjoys presenting his lively Alpha-Sketch programs and readings at schools and conferences throughout the southeast. ​Sign up for THE 26TH, the Alpha-Sketch newsletter delivered on the 26th of every month.